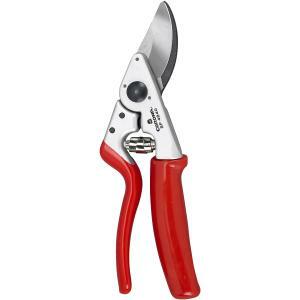 The Corona Rolling Handle Bypass Pruner is a forged aluminum bypass pruner that provides maximum performance and quality for the casual to master gardener. The lightweight, forged aluminum construction is strong, but ideal for extended use. The rolling handle is designed to reduce hand stress while enhancing comfort. Its precise cutting action is maintained with an innovative geared pivot bolt and locking nut system that virtually eliminates loosening during use. The narrow profile and slant ground hooks allows for easy access into tight spaces. The self-cleaning sap groove provides cleaner cuts time after time. The volute spring resists clogging and keeps your cutting motion smooth.